Guided by the Tata values and vision of creating a better tomorrow, Tata Power Solar is committed to environmental excellence, community care, sustainable product manufacturing and ensuring health and safety of its dynamic workforce. Tata Power Solar, in its endeavor to deliver word-class products, is equally focused on adopting sustainable business practices. To ensure a sustainable future, our products are manufactured using eco-friendly processes, thus ensuring the environment is not adversely affected. Our projects also lead to various employment options for the communities residing near the installations and we imbibe sustainable practices in our employees, partners and the supply chain to reduce the impact on the environment. Tata Power Solar adheres to uncompromising standards to the Health, Safety and Environment norms, the benchmark in Indian manufacturing industries. Corporate Social Responsibility (CSR) is embedded in the Tata Power Solar ethos, and ties in with our core business of promoting economically and environmentally sustainable solar power products. 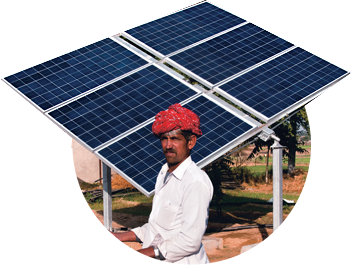 At Tata Power Solar we go that extra mile to empower the communities we touch, with more than just solar power. Our CSR initiatives reaffirm our commitment to empowering communities and building a greener tomorrow. At Tata Power Solar, the CSR initiatives revolve around Healthcare, Education, Infrastructure Development, and Empowerment.